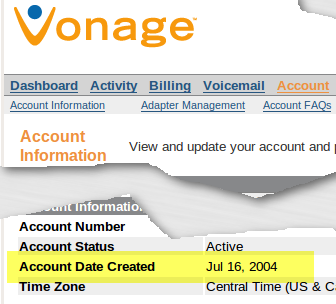 We’ve been Vonage customers for 5 years come mid-July. This very likely ends soon. Let’s first say something, though: overall, we’ve enjoyed having Vonage. It was nice to be able to tell Ameritech/SBC where to stick their lackluster customer service and ridiculous billing. The Ameritech/SBC rep at the time had no idea what Vonage even was (which would hopefully no longer be the case). We’ve had Vonage for our mixed-use/SOHO line since 2004. It’s been pretty good for us, mostly. We’ve never used it that much, so the 500 (outbound) minutes per month plan for $15/month seemed like a pretty good deal. It was actually more than we needed at the time; as it turned out, we had to work pretty hard to even use 300 minutes in a month–and that’s only happened a handful of times. So for $15/month, we had a fairly nice, relatively-inexpensive solution to keeping a landline in our home for the random phone call we needed to make or–more critically, really–receive. And it worked pretty well. Once we worked out the router QoS settings and gave it the right amount of bandwidth, you’d never know it wasn’t a ‘real’ phone line. We did go through a period where we had a lot of problems with Caller ID, though… even going without it at all for more than a year at one point. We wrote and called them and attempted to get someone to even acknowledge the CID issue, but Vonage was unwilling and/or unable to work with or help us. In the end, Vonage additionally refused to issue us a credit for any of our hassles at all–despite it eventually being a well-established issue by many other Vonage customers on many Vonage-related forums and other websites–because, in their words, “you’ve had active service all along”. We’re not paying for just the dialtone, Vonage; way to miss the point! We were not amused, but at the same time, it was still the best bang/buck option available to us… so that came and went, and came again briefly, and went again… and overall, for fifteen lousy bucks a month, there’s just not that much complaining you can do. And then the fees started to accumulate, bloating our bill. Vonage started acting like a Real Phone Company, insofar as feeling it necessary to preemptively charge us for taxes and other fees they felt they might eventually have to start paying should they not get a pass on VoIP-related legislation. We were getting Milwaukee County Miller Park renovation fees tacked onto our Vonage bill. Really, Vonage? We started feeling like we were back with SBC/Ameritech, getting nickeled and dimed all over again. Vonage was also involved in a lawsuit or two along the way, which no doubt redoubled their efforts to be as “preemptive” as possible collecting as much money from their customers as they could get away with. Our $15/month was rapidly turning into $18, $19, $20/month… a sizeable increase for something that shouldn’t really increase at all. It’s really no different than having a subscription to an online game, after all. It’s an online service we use over the Internet. Not really any different than web browsing, instant messaging, telnet, ssh, irc, and on and on. Well, it seems Vonage is on another money grab. As of February, they’ve raised the rates on their $15/month plans to $18/month. With the fees, this jacks up our monthly bill to nearly $23/month. For a 500-minute plan. Yeah, we’re just dying to do that. Looking at a recent billing statement, we used… thirty minutes the entire month of April. Thirty. Our $23/month bill, including fees and taxes, means we’re paying a nearly-ridiculous $0.77/minute. If we upgraded our plan to the “unlimited” (note: not really unlimited-read the fine print!) $25/month plan, after taxes and fees, we’d be paying right around a dollar a minute. A dollar a minute! So, as a result, Vonage will almost certainly be losing our business. We’re apparently not tethered enough to our phones to make it worthwhile, and they’d rather not bother. it’s a shame, because VoIP with Vonage could be one of those Great Equalizers, able to accommodate everyone at every usage tier and/or income level. And indeed, I thought that was kind of the point of Vonage in the first place. A for-profit business, to be sure, but also a company clearly interested in being a reasonably-priced VoIP provider that could and would dominate and maybe even destroy the Bells, bringing everyone along into VoIP fold. Maybe Vonage feels they’ve succeeded at that, I don’t know. If so, they’re wrong. They’re certainly facing increased competition from Internet providers that are offering similar–and often more featured–telephony options alongside their Internet service. What Vonage needs to do is consider the lower end of the market; something no one else is really doing effectively. “Skype”, you might say… but Skype isn’t really pedestrian enough a solution for most people. People want what seems and feels like a real phone. Skype too often feels like a toy (and frequently sounds like one, too). It’s great for all the geeks, but it’s not such a hot solution for the grandparents. Vonage could easily offer lower-end services, at even lower prices, for people interested in paying less because, hey, they use the service less. What will be happening instead is Vonage will be losing those customers they’re attempting to force to upgrade, that already don’t get full use of the lower-tier plan. And again, after taxes and fees, I’m guessing Vonage’s $25/month unlimited plan would top out over $30/month, which means last month’s 30 minute of usage here would end up costing us a buck a minute. No thank you. So Vonage, either offer us something that will keep us around, or they’ll lose us. And others like us, no doubt. I’d think even $10/month is still better than $0/month, for those that barely use the service, but would still like to have something around that works reasonably well. Even a cheap parking/forwarding service, to keep the number and allow inbound-only calls… I’d strongly consider it, and I’m sure others would, too. And of course, too, we want something we can hang onto and not have to change. We also don’t want a Sunrocket situation with Ooma going belly-up and leaving us and our phone number stranded and difficult if not impossible to recover. Of course, I have no idea what it costs Vonage to maintain a line and number for a customer, so maybe that’s part of their pricing, too… but surely there’s some kind of option to keep Vonage from losing the lower-tier customers. Jacking up the price, by the way, if it wasn’t already clear… isn’t really one of them. So, Vonage, we prepare to bid thee adieu. Will you be around still in 2, 3, 5 years? Who knows. It’s no longer a bet we’re willing to take. Update: Vonage has been running commercials recently bragging about how they’ve never raised prices. Watch the commercial closely. They specifically limit their claim to their $25/month “unlimited” plan. They conveniently leave out the gouging they’ve been doing trying to force people off thei 500-min/mo plan, jacking that up from $15/mo to $18/mo. They’ve also not mentioned they’ve kept adding fees to the bills over time, causing increases of several dollars over the years in the total price of the service per month. In a nutshell, the commercial’s technically truthful, but otherwise fairly dishonest and deceptive. Buyer beware. “Mary”, you certainly do make a valid point about us being losers! In a retail sense, as consumers who’ve spent money at Colder’s expecting to be treated honestly, fairly, and with respect, we are indeed huge losers so far! And so are many other people who have given Colder’s their hard-earned money at one time or another. We’re all big losers because we shopped at Colder’s! As for getting a life, “Mary”, that really got us pondering! Who might have less of a life and more urgently need to “get” one: people raising awareness of a company ripping off consumers, detailing shoddy customer service and their experiences so others don’t make the same mistakes, or employees who willingly take 100%-commission jobs and then reduce and demean themselves chasing down shoppers like the filthiest of lawyers chase down ambulances? We prefer to remain in the non-stalking, pro-consumer, down-with-crap-companies camp, thank-you-oh-so-very-much. We then wondered: could someone be considered a big loser lacking a life if they spent part of their Easter Sunday leaving comments like yours, above? Any insight there, “Mary”? At least you didn’t call us extortionists! “Mary”, it’s perfectly OK to disagree with us. Really! However, a tip, if you don’t mind one: if you really want to have an impact, some actual substance to accompany the grade-school-variety name calling might help you establish your position and even ‘win’ the discussion. For example: what about our observations and opinions lead you to believe we have no lives? What is it that you feel really, truly makes us big losers? If you work for Colder’s, or have some other less-direct affiliation with them, that alone is OK; we definitely don’t hate you or anyone else for just that, at all. There’s really no need to take any of this personally, either, “Mary”. What parts of our very real observations, opinions and feelings about our Colder’s experiences bother you so much, and why? As it stands, “Mary”, you’re apparently calling us names like some kind of self-indulgent, insolent child for pointing out–truthfully and honestly, by the way–that we don’t like to be treated badly. Do we want to be literally hunted like so much prey in the case of the Grafton Sales Stalker when we visit a Colder’s store–or any retail store? No, thank you, we do not. Do you? […] we have absolutely no interest in buying from someone that doesn’t respect us, our space, or our time to shop at our own leisure. We can’t check out items in the store when we’re feeling eyes burning into our backs as we’re standing there. We feel like meat. 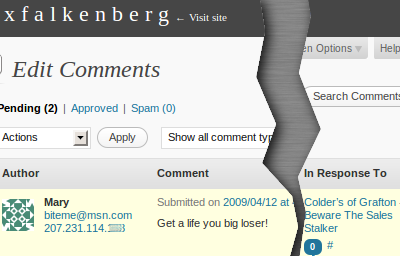 Reading that, your get-a-life/big-loser comment really doesn’t make any sense–to us, anyway–unless you’re the stalker or are otherwise just trying (and failing) to defend the stalker, Colder’s itself, or both. Do you believe being treated like that as a customer is acceptable? Would you honestly appreciate that as a consumer? Is such behavior appropriate for any salesperson? Would such a technique get you to spend a lot of money with that salesperson and their store/company? Did you answer ‘yes’ to any of these questions, “Mary”? So please, do feel free to try again, “Mary”. Really. We’re listening and want to hear what you have to say, assuming you actually have more to say. While we have stated many times that we value every comment we receive, some are ultimately more–or less–valuable than others. Try to make your next one really count. OK, “Mary”? And again, reiterating: We absolutely recognize commission sales jobs can be hard. We know a lot of good people work them. Many because they have no choice. Others because they’re good at it. And some people even like it. We do indeed recognize and respect the work and people out there doing it. But in the case of the Grafton Sales Stalker, we’re confused about how throwing all dignity and self-esteem out the window is even remotely worth whatever money she might make from it. We’re not laughing at this person. We feel sorry for her. Such extreme behavior is embarrassing to watch. It seems so…desperate. Unnecessary. Rude. It’s very uncomfortable for us as shoppers. It does not make us want to visit Colder’s Northshore in Grafton or any other retail establishment that has employees behaving like that. We have avoided the Grafton Colder’s many times because we just don’t want to be accosted by that woman yet again. We’re convinced she drives away more sales than she makes, stalking people like that. By the way, “Mary”, before we forget: we were completely unable to reach you at the “biteme@msn.com” email address you provided. Maybe just leave us your @colders.com email address next time? Thanks again for your comment, “Mary”! I am very disappointed in the poor quality of customer service I’ve experienced from Colders. I purchased a living room set of a sofa, loveseat, and recliner at the Grafton store. I placed my order with Cindy Hoffart on Saturday 7/12. She completely neglected to tell us the chair was on backorder and when we left the store we were expecting a complete delivery of all three pieces. On our scheduled delivery date, Friday 7/18, I called the store because I had no idea what time to expect the delivery. The person on the phone read my order out loud and mentioned a love seat and sofa. I said we ordered a recliner too and her reply was, “The recliner is on backorder. Didn’t you know that?” I replied that I didn’t know that and she said she would email our salesperson to find out the details. Shouldn’t the “customer care” department know the details? It was then I finally looked closer at our receipt and I saw BACKORDER after the recliner. Early Saturday morning we received a voice mail from the saleswoman we worked with. It was a standard courtesy call after a delivery. She asked how everything went. She did not mention anything about the recliner in the message so I called her back. I asked her when we were getting our recliner and she said that was the reason she called earlier (but said nothing about it). She told me she was not at a computer where she could look up the status of my recliner and she would call me back in 30 minutes. She never called back. I called the store this morning, Monday the 21st., and asked once again, when I could expect to receive my recliner. The woman on the phone said more were due in this week and one could be sent to the Grafton store for me to pick up. Even though I paid to have all of my furniture delivered I am going to pick up the recliner with my own car because I am tired of waiting. I might also add that everyone I’ve talked to on the phone sounded like they were half asleep, they weren’t very friendly, and your phone system is awful. I could barely make out anyone is saying no matter where I called from. Over the next year my wife and I were planning on buying new office and bedroom furniture. I can assure you we won’t be buying these items or anything else from Colders ever again. We certainly won’t be recommending your store to our friends and family either. Either way, it’s undeniably terrible customer service–completely unacceptable behavior for any retailer.